As the London Film Festival continues, I have gotten the chance to see several great films, and this one is no different. Arrival is a true futuristic sci-fi classic with a great twist, and a potentially career defining role for Amy Adams. Denis Villeneuve directed this science-fiction suspense film about Earth's response to a possible alien invasion. 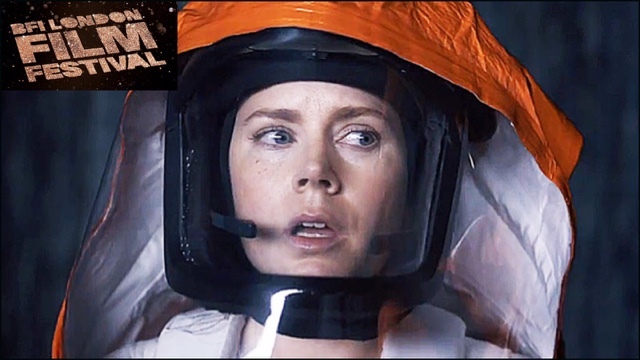 After extraterrestrial spacecraft land at various locations around the globe, a linguist (Amy Adams) and a military colonel (Forest Whitaker) investigate what these mysterious visitors want and whether they pose a threat to humanity. Jeremy Renner and Michael Stuhlbarg co-star. I have been looking forward to Arrival since I first saw the trailer. It looked fantastic... And yep, it lived up to my expectations... IT. IS. FANTASTIC. It is ambitious, brilliantly directed by Dennis Villenueve, and beautifully shot by Bradford Young, Amy Adams gives a sensational performance as Linguist Louise Banks that is, as I said, career defining. Adams has been one of my, if not my favourite actress working today. I have loved her since I first saw her in Enchanted. She never phones it in, in my opinion. And her performance here is by far her best. Better than her excellent performances in The Fighter, American Hustle, Her, The Master, and the aforementioned Enchanted. She is fearless in this film. She conveys so many layers. She's just incredible. Jeremy Renner is also great here. One of the first things I said to my dad after we left the screening is how I think Renner is underrated. Despite two Oscar nominations and being apart of the highest grossing franchise of all time (The MCU), he isn't really ever in the conversation of the best actors working today, which I think is a shame, because he is really, really good here. He conveys a sort of average schmoe, but is really, really smart. Kind of like Richard Dreyfuss in Jaws. Speaking of Jaws, the tension in this movie is palpable. The very first time Adams, Renner, Forest Whitaker (who is also very solid here), and the rest of the crew go into the "spaceship", my heart was pounding. The music by Johann Johansson playing just made my pulse go even higher, and the direction by Villenueve in that scene is masterful. Villenueve's direction throughout the whole film is masterful. His direction echoes that of Sir Ridley Scott, Christopher Nolan, Alfonso Cuaron, but he still keeps his own signature style, which is really encouraging for next year's Blade Runner 2049. The script by Eric Hessier is, right now, easily my pick for what should win the Oscar for best original screenplay. He has written a unique, multi-layered film with great characters that, I think, will be considered a modern sci-fi classic. Oh, and without giving away any spoilers, the twist is beautiful. It shocked me, moved me to tears and made sense. Thank you Mr. Villenueve, for directing my favourite sci-fi film of the past few years.